Prime Minister Narendra Modi on Saturday shared with his Australian counterpart Tony Abbott and United States President Barack Obama the fascinating story of an American architect who had an emotional link with their countries. 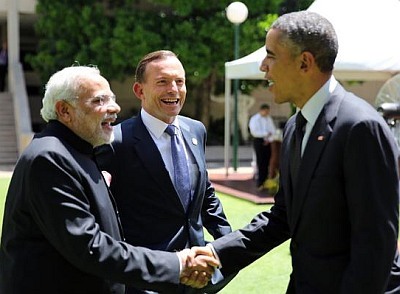 The discussion among the leaders who met for the G20 summit in Brisbane centred around Walter Burley Griffin, the well-known American architect who designed Australian capital Canberra and who is buried in Lucknow. The prime minister shared with Abbott and Obama the fascinating story of Griffin, External Affairs Ministry spokesperson Syed Akbaruddin tweeted. A couple of photos of the three leaders engaged in the discussion were posted on the spokesperson's Twitter account. 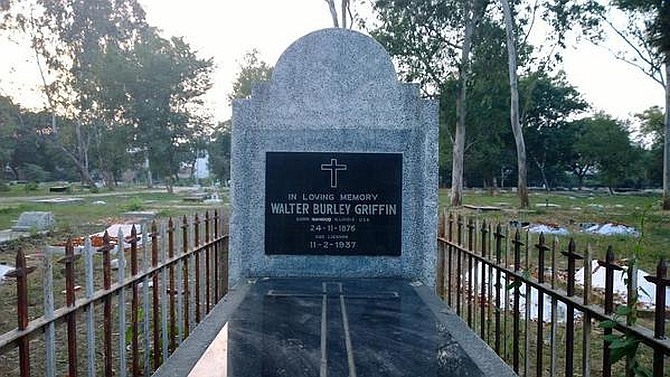 A photo of the final resting place of Griffin at Lucknow Christian Cemetry was also among them. Griffin, who died on February 11, 1937 at the age of 61 years, was a landscape architect who hailed from the US. He is known for designing Canberra, Australia's capital city and has been credited with the development of the L-shaped floor plan, the carport and an innovative use of reinforced concrete. Influenced by the Chicago-based Prairie School, Griffin developed a unique modern style. He worked in partnership with his wife Marion Mahony Griffin. In 28 years they designed over 350 buildings, landscape and urban-design projects as well as designing construction materials, interiors, furniture and other household items. Through their contacts during their time at the Greater Sydney Development Association, Griffin won a contract in 1935 to design the library at the University of Lucknow. Although he had planned to stay in India only to complete the drawings for the library, he soon received more than 40 commissions, including the University of Lucknow Student Union building; a museum and library for the Raja of Mahmudabad; a zenana (women's quarters) for the Raja of Jahangirabad; Pioneer Press building, a bank, municipal offices, many private houses, and a memorial to King George V.
Griffin also won complete design responsibility for the 1936–1937 United Provinces Exhibition of Industry and Agriculture. His 53 projects for the 160-acre site featured a stadium, arena, mosque, imambara, art gallery, restaurant, bazaar, pavilions, rotundas, arcades, and towers. However, only a part of his elaborate plans was fully executed. Griffin was inspired by the architecture and culture of India, modifying forms as "he sought to create a modern Indian architecture". His wife Marion traveled to Lucknow in April 1936 to assist and contributed to several projects. Griffin died of peritonitis in early 1937, five days after gall bladder surgery at King George's Hospital in Lucknow, and was buried in Christian Cemetery in the city. He spent the last 15 months of his life in Lucknow. When world leaders got INSTA-FAME!